I don't know about you but I am overwhelmed already. Taking down fall, crafting, dragging out Christmas, and still working, cooking, and trying to clean and pick up. First I put out the spray painted snow village in the bathroom, then I decorated the mantel in the living room, and I just finished a vignette over the sink in my kitchen. 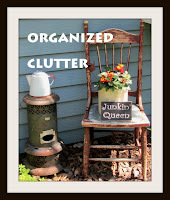 I'm sure that somehow all this clutter will be organized by Christmas! Last summer I found four really neat gingerbread baking pans at the consignment shop for $1 each. I think they are home made, and spot welded. I don't think they are cookie cutters but little pans for actually baking a gingerbread inside. Anyway they are very cool, and I couldn't wait to use them for Christmas. I started out with some vintage sifters. This one has two cloth gingerbread men from a local craft shop, The Tattered Angel. And a medium sized sifter for a medium sized bottle brush tree. Then I loaded my little wood cubby shelf also from the Tattered Angel with three of my gingerbread pans, a gingerbread look cookie, a Jello mold with a grubby flameless candle, silver ornaments in a couple sizes and some faux snow. The gingerbread pan men have thick Alpine looking yarn tied around their necks. Loving the vintage, rustic look! I just love your vintage gingerbread man theme, looks beautiful and fun! Oh Carlene, I just love your sweet kitchen vignettes! Love your little gingerbread cookie display. So cute. I have some gingerbread things that I set out for Christmas, too. I was just thinking about my flour sifter the other day about how it is probably considered vintage, hah. Adorable! Great use of the pans, but I hope they end up making some cakes this season too! Another fabulous vignette. Those Gingerbread pans are adorable! Are we alike or what? I am laughing as I type this. My kitchen and family room is gingerbread and candy themed. It's all finished except for the tree. I put out two of my old sifters and a couple pastry cutters. I have an old bowl with gingerbread cookies in it. Now here's the thing. I put a mini bottle brush tree in a metal cup. After seeing this I added a white tree I had in one of my sifters. Planning on doing a post on Thursday. Love your vignette! The pans were a great find. I have that stamp that was used on your tag. May need to make one. It's too cute. Also love your new header with your projects. Carlene, I am such a duffus! Forgot that I was saving the post on my kitchen until our Creating Christmas blog hop. lol! Thought it would work to link to Cindy's Farmstyle Christmas on the 3rd. Love the gingerbread men!!! Looks great! Love all your gingerbread!! The bottle brush tree are adorable in the sifters!! Your gingerbread cutters are wonderful and perfect for rustic kitchen decor! I haven't unpacked a single Christmas decoration yet! How cute! Gingerbread is one of my favorite things about Christmas and I just love this! This is too cute I love the gingerbread and the bottle brush trees. This says Christmas. Carlene I am loving this look too! I think the little candle in the mold is sweet! I love that little cubby shelf...so versatile! Those molds are precious! What a great looking shelf. Your little gingerbread pans are so unique -- I love them. Love your trees in the sifters and little gingerbread vignette. No wonder you're overwhelmed... you've been B.U.S.Y!! It all looks wonderful Carlene! What a cute little vignette... so creative. I would never have thought to put little trees in the sifters...wow! Love it all Carlene! Carlene--I'm totally loving your rustic look, too! The tree in the sifter--what a totally great idea! Carlene, your gingerbread themed decorations are completely adorable. Those pans are amazing. How cute are the little gingerbread men! What a creative way to use the sifters in a vignette, I have to remember that one! Great job. ADORABLE!!! What a wonderful way to display your gingerbread man and those pretty bottle brush trees! What a delightful post. Your gingerbread men are as sweet as can be. I love that they are thrifted and so rustic. You have such a wonderful way of arranging charming little items in such an artful way. I just found a gingerbread man sewing pattern in a thrift shop for only 25 cents. Your post inspirs me to make it up. Thank you for your kind visit and comments on my blog. I enjoy your blogging friendship so much. Girl, you are giving me so many ideas! Creative vignettes with my favorite vintage items! So cute!! I love that little cloth gingerbread guy on the right with the tag too!! So cute!! Makes me want to sew up some prim gingerbread guys now!! Oh My Gosh .... I love the gingerbread cookie cutters. They looks so neat in your display. Must get back over to the Thrift store and get some. How cute! I love gingerbread men and I love your gingerbread men pans! Love how you arranged everything! This is a gingerbread lover's dream!! I love gingerbread (the food AND the figures) and love how you brought this vignette together. Just wonderfully homey! Very cute , just not ready for Christmas decorating yet!! !